The 101 Worry-Free HCG Diet Recipes book by Leanne Mennemeier and Linda Prinster offersmany creative alternatives to your average Very Low Calorie Diet/Phase 2 meal on the HCG Diet. Plus, it has an entire section at the end with HCG tips and tricks to help you get through Phase 2 smoothly and with maximum HCG weight loss. The fast and easy VLCD recipes in this book include everything from Rosemary Fish and Asparagus, to French Onion Soup, to Crunchy Chicken Salad, and a Beef Curry HCG recipe that will knock your socks off. The variety of flavors and combinations will keep you excited about your HCG lunches and HCG dinners (and even HCG desserts!). Remember, the more variety you can get from your limited HCG food options, the greater chance you have for HCG success. If you don’t have enough variation to your HCG food, you’re more likely to cheat or worse, give up altogether. With this book, you won’t have to worry. 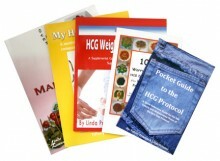 You’ll look forward to HCG meal times and you may even be inspired to come up with your own VLCD meals.